The Orpheum just posted on Facebook that tonight’s performance of The Jersey Boys has been cancelled due to severe weather, in accordance with local government authorities. They’re not doing refunds, but you can exchange tickets for a later performance. Exchanges must be made by Feb.3. Show runs through Feb. 14. Ticketmaster customers, call 1-800-653-8000 or go to your point of purchase to exchange. If you purchased direct from the Orpheum, call 901-525-3000. 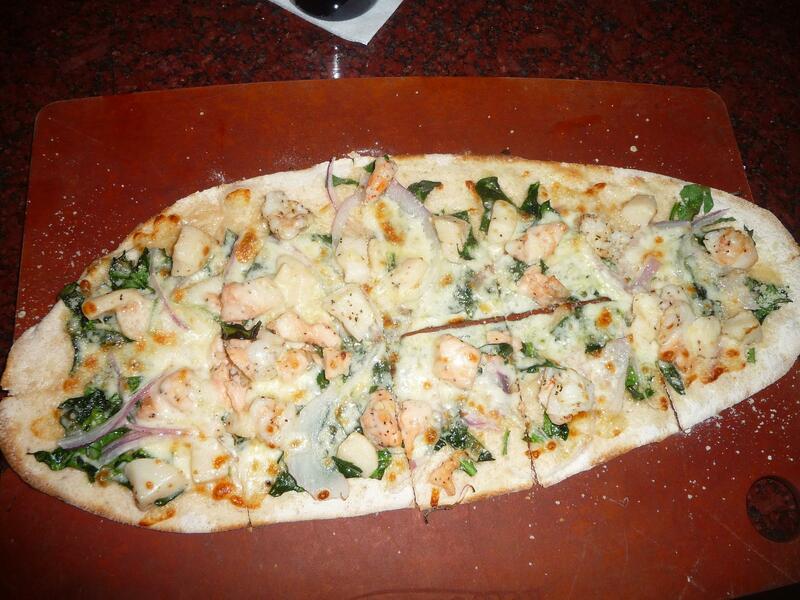 This flatbread isn’t on their regular menu, but it frequently shows up as the flatbread special on Fridays. On to the Saucer. Sierra Porter Fire Sale + Brittney bartending = Saucer fail, but what am I going to do, stay home? I just got a message on Facebook from Christina, aka “C-Pop,” who is organizing the Jersey Shore Pub Crawl. Due to the winter weather they’re moving the pub crawl back a week, to Saturday, February 6. All other details of the event will remain the same. Search for “Jersey Shore Pub Crawl 2K10” under events on Facebook to keep up with the latest news on this event. It’s gonna be a good day! My manager called slightly after 8 from her cell phone, and said the office was closed for the day. I’d already called in and left a voicemail on her work extension saying I was staying home, but with the office closed it won’t cost me a vacation day. On the agenda for this snow day Friday: Bars and PokerStars. But first, a post. Not sure which bars will be open… I’ll be out this afternoon and will try to tweet to my @paulryburn account which bars in the Downtown core appear to be open for business. I have advanced knowledge that Kooky Canuck will be open… Shawn posted on Facebook that they will be no matter how much snow and ice hit. Being a Canadian, I’m sure 5-10 inches of freezing precip is nothing to him… he’d probably open if 5-10 feet of snow fell. Big concert at the Center for Southern Folklore tonight… Kate Campbell. Not only a concert though, but an on-stage interview. $15 tickets in advance, $18 at the door. Go to www.southernfolklore.com for tickets. Kate is already in town (I saw her and Judy from the Center last night at the Majestic) so this show should go on despite the weather. There was an article in the Flyer that Spindini is the latest restaurant to get into the Sunday brunch business. They’ll have a $6 cold buffet/pastry table with assorted pastries, fresh fruit, bruschetta, and breakfast pizza. There will also be a $6 hot buffet with potato and lobster hash, roasted garlic egg strata, creamy polenta with smoked mozzarella, and rigatoni with vodka sauce and sausage. Brunch buffet? They better be prepared to lose money on this venture if the Nuh-Uh Girl finds out. They’ll also have a la carte selections at $7 each: Oscar benedict with crab meat, Italian benedict with proscuitto, Florentine benedict with spinach, traditional Italian omelet, ham and cheese omelet, Tuscan omelet with veggies and goat cheese, and French toast with syrup and whipped cream. I haven’t spent much time in Spindini since it opened, but the article about the brunch in this week’s Flyer leads me to think I’ll at least give it a try in the weeks to come. Kevin, one of my favorite bartenders from the Sleep Out Louie’s days, is now operations manager at ‘dini. I just hope I don’t have a bunch of cougars hitting on me while I eat. Hopefully they moved east with Judd. It’s a beautiful day to have a 13th story apartment with huge windows… watching the snow fall on all the buildings. Only thing is, since the blinds are open I actually have to wear pants while I type today’s blog post. The north windows of One Commerce Square see directly into my apartment. There are probably a few females who work in that building who’d love a free peek at the merchandise… sorry ladies, you have to buy me drinks first. Still need to put up a post about a benefit for Haiti the Center for Southern Folklore will have, but I’m going to wait until after the Kate Campbell show. CSF staff, remind me if you don’t see a post in a couple of days. Wonder if the Saucer will be open today… even if it does, I have advanced knowledge that Brittney is the day bartender, so I’m not that excited about being there. Excited that I get to spend the day focusing on poker rather than bridge… my new plan is to start entering H.O.R.S.E. tournaments as soon as I learn all the games. In HORSE tournaments on PokerStars, the game changes every 12 minutes, rotating between fixed-limit Hold’em, Omaha hi/lo, Razz, Stud, and stud/Eight or better. Currently reading the chapter on Stud by the late, great “Chip” Reese in Doyle Brunson’s Super System . All right, enough typing, time to jump in the shower and prepare to enjoy this SNOW DAY! 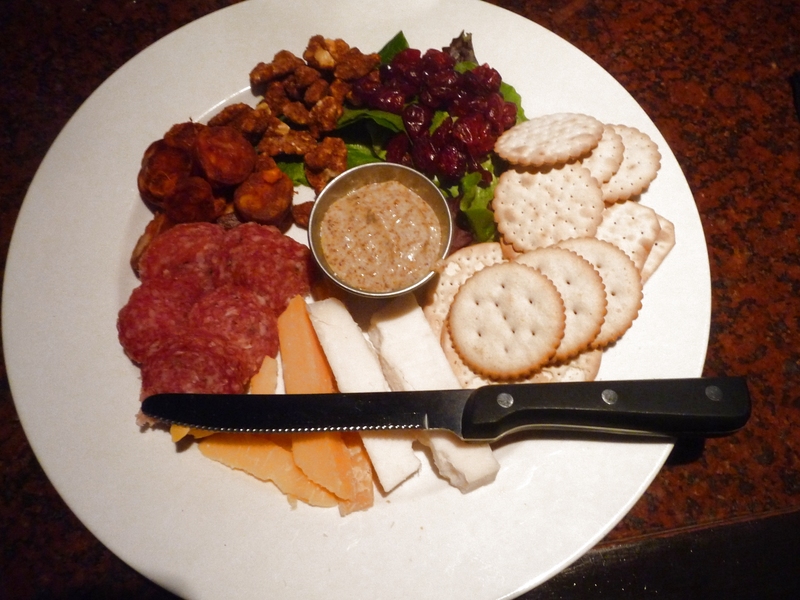 Cheeses, meats, Majestic BBQ walnuts, cranberries, and crackers. I must admit, I thought to myself, “WTF are the cranberries there for?” and then I took a bite of cranberry and then the darker yellow cheese and I understood. If this were on Kooky Canuck’s menu it would be called the Magan and Meghan Platter. I just received an e-mail from the CCC’s director of safety. He attended a Shelby County Emergency Management meeting this morning and learned more about the weather event that will happen in the next 24 hours. It’s being classified as a “major winter storm event” with the onset of rain. This may change to freezing rain and sleet around 3 AM tomorrow morning, with possible ice accumulation of 1/4 inch on the roads. The sleet should then change to snow with accumulation of 4-8″ by Friday evening. Temps will be around freezing at the start, then dropping into the 20s, and may not get above freezing before Sunday afternoon. In addition, wind could make things worse at 15-25 mph with gusts to 25-30. The wind, combined with the weight of ice, could knock down tree limbs and power lines. As the safety director noted in the e-mail I received, weather forecasting is not an exact science, but fortune favors the prepared mind. Y’all be careful out there. One thing to keep in mind is that even if temps are 33-34 or so, slightly above freezing, during morning rush hour, they’re likely to drop into the 20s and ice everything over while people are at work. So, if it looks like you can drive to work in the morning, keep in mind that you might not be able to make it back home. Just wanted to pass that info along… I have news about a new place doing Sunday brunch and a Haiti benefit, but I think that it’s important that the weather info stays up top for the afternoon. Second Street Shoppers, the convenience store across the street from the Peabody, has a website now. In addition to convenience store items, they have cigarettes, beer, lottery tickets, and a deli with sandwiches, wings, pizza, and breakfast items. Check out their website here. I’m delaying Part 2 of my advice to students asking if they should major in computer science. I received some very insightful comments from a reader this afternoon, and the comments have caused me to somewhat back off my statement that math is not a premium kicker to go along with a computer science major. I want to take a few days to ponder his excellent comments and then re-write. Apologies for the delay for anyone waiting for Part 2 but I think it will be worth it. Memphistanista reported on her blog this morning that The Pier has closed. The Pier was located on Wagner, facing the river just south of Union. It had been open since 1977. Memphistanista commented that she was surprised it remained open as long as it did – she hadn’t been there in 15 years. I often wondered the same thing about the Pier – never had anything against the place, but it just wasn’t on my radar because it was off the beaten path. The only time I ever went in there was to get drinks during Rajun Cajun Crawfish Fest. Even though it wasn’t one of my hangouts, it’s always a sad thing to see a Downtown business close. I saw on the event listings for today at DowntownMemphis.com that free H1N1 shots are being given at Calvary today from 5 to 7. Not sure if this is open to the general public or focused mainly on the homeless (Calvary does a lot of outreach work), but if you need a shot, you might want to check this out. There will be a “Stars and Stetsons Kickoff Party” at Kooky Canuck on Saturday, January 30. This will be a free event with no cover to kick off the upcoming Stars and Stetsons party to benefit the Alzheimer’s Foundation. You can join Brian Elder from KIX 106 and pay only $1.06 for Bud Light from 8 PM to 2 AM. Nashville band The Mulch Brothers, who will headline the Stars and Stetsons party, will take the stage at 10. A new tournament cycle begins tonight in Bardog’s weekly poker tournament in the Underdog Room. In addition to weekly prizes, you can accumulate points toward a grand prize over a period of several weeks. 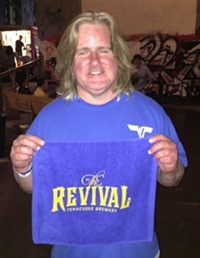 You get points for finishing in one of the top 6 spots in the tournament, and you also get points just for showing up, for bringing a friend who has never played in the Underdog Room before, and for answering the trivia question in Poker Jon’s weekly e-mail. The Woot-off continues on Woot.com. I want some crap dammit! I’m refreshing Woot throughout the day hoping to catch it when they put Bag of Crap on sale. There’s a new market called Trolley Stop Market that will open at 704 Madison in April. Their listing on Facebook reads, “TSM is committed to promoting, selling, & serving locally grown food & artisan goods. Breakfast & lunch available Monday – Friday 7:00 – 3:00 pm. Look for local veggies, fruits, mushrooms, nuts, herbs, plants, flowers, grains, breads, granola, honey, beef, poultry, pork, seafood, skincare, pottery, candles, & much more.” You can become a fan of the market on Facebook to keep up with the latest updates. Looks like snow and ice is in the forecast for Friday. Wintry mix conditions seem to bring out the worst in everybody in this town. You have the people who drive down the highways like they’re in a demolition derby. You have the people who panic and buy months-long supplies of bread and milk at the grocery store. You have the people who complain that Kriner Cash is the devil when he doesn’t close the City Schools when the first flake falls. And then on the other side of the coin, you have people who needlessly stress everyone out with their “Memphians are lazy and just use ice and snow as an excuse to get a free day off, nut up and shut up” BS. Reading the comments in any CA article related to winter weather just makes me hate everyone. Plans for tonight: Hmmm don’t know. I want to get a couple of hours in on PokerStars, but there’s no reason I couldn’t take the netbook somewhere and have a beer while I play.